January 29: I arrived in Seward after a long flight and overnight stay in Anchorage. The ride to Seward looked a lot different than it did the last time I was here. It was dark until about 8:30AM and there is so much snow! When I was here in October, the Alaska SeaLife Center (ASLC) staff told us that as the snow moved down the mountain tops it made its way to the town-boy were they right! My arrival into Seward was a lot more comfortable this time. I knew exactly where to stop to get lunch and where to pick up snow pants before I headed to the center for my first shift. I felt like a seasoned expert! When I arrived at the center I coincidentally met up with some ASLC staff in the lobby including Dr. Carrie Goertz and trainer Margaret Black. It was great to see them again; especially as soon as I walked in the door! Margaret brought me to find my boss, Curator of Marine Mammals and Birds at Mystic Aquarium, Laurie Macha, who was just finishing up her two-week stay caring for Tyonek. When I first saw him I couldn’t believe how big he had gotten! He is much grayer in color, too. None of the pictures that I had seen had done his transformation any justice! He looks like the picture of health. It’s so great to see how strong he has gotten over the past few months. 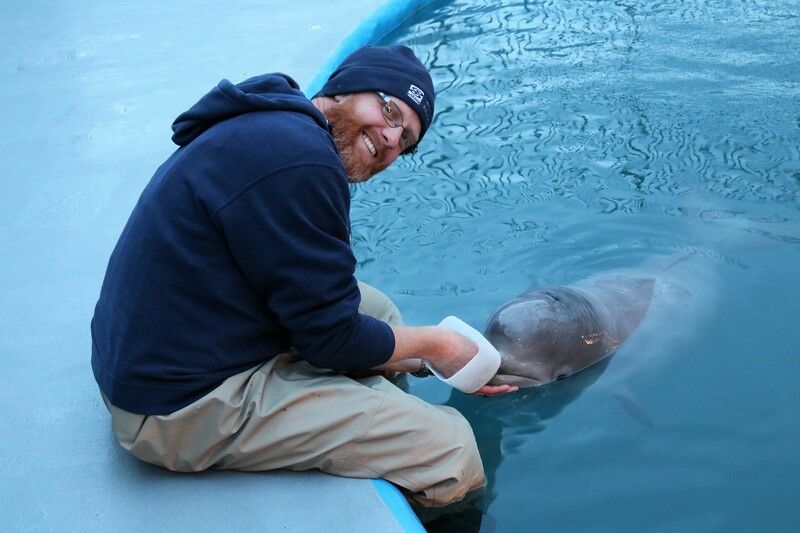 I find it incredible that since October 1, 2017, Mystic Aquarium, along with Georgia Aquarium, Shedd Aquarium and SeaWorld have volunteered staffing from their own facilities to assist Tyonek’s rehabilitation. I am so humbled to continue being part of this effort. Laurie gave me the rundown of the shift I was on and we set up to feed him a bottle. I am in awe seeing how fast he finishes a bottle now! When I left in October we were still teaching him to nurse from the bottle. While he had some feedings that were pretty efficient he was not that consistent. Today it takes longer to make his 800mL bottle than it does for him to drink it! He sucked it down in two minutes! When I left in October we were still taking about 15 minutes to get him to eat ~400mL. His progress is outstanding! I said goodbye to Laurie as she headed back to Anchorage for her trip home. The last few hours of my first shift flew by. I am excited to get settled in at Dr. Carrie’s house again and officially begin my time here tomorrow morning at 8 AM! January 30: Today is my son Owen’s 6th birthday! I was up at 1:30AM as I started to get many texts about the snow day that was occurring back in CT. There was no school for Owen and the Aquarium was not open to the public. I was promptly alerted to both current events by several people. The four-hour time difference is something that is always hard to get used to for both me and the people at home! So I guess it was good news that I was awake in the middle of the night so I could call Owen to talk to him before he started his day. It’s extremely hard to be away for his birthday but he and my husband, Justin, are so supportive of my time here is Alaska. We are a family who shares a passion for animal care and our ocean planet! I arrived at the Center and did the first feed of the day with Liz Statdler, a Trainer from Georgia Aquarium. She is working the 12:00AM-8:00AM shift, so we will always have a few minutes of crossover before I take over. The beluga staffing here is much less than it was in October. I am by myself for my eight-hour shift with the occasional pop-in from the ASLC staff who is busy caring for their animals each day. Because Tyonek is doing so well and is much lower maintenance, it is not necessary to have multiple staff monitoring him 24/7. Right now there are only three visiting staff members total, including me, caring for Tyonek. When I left we still had 2-3 people each shift with around 6-8 visiting staff members from varying facilities. My, what a difference three months makes! We have started to implement a variable schedule for feeds during the hours of 8:00AM-8:00PM. This means that we have a target volume of formula for him to consume during those 12 hours but it can be fed variably. Out in the open ocean he would be nursing for shorter periods of time and drinking variable amounts of milk during his feedings; so it makes sense to try to introduce some variety to his feeding schedule. It will be a fun challenge for me to schedule my eight hours each day differently for the next two weeks. This will be enriching for both of us! January 31: I’ve settled into a routine (or a non-routine, I should say due to the variability) J and things are going well with Tyonek. The ASLC staff is getting ready for their annual Gala this weekend in Anchorage so a lot of preparation is being made; getting auction items together and making last minute preparations. I’m told it’s always a great turn out and I can’t wait to hear stories about the event from my colleagues who will be attending. Today I spent a lot of time cleaning both around Tyonek’s habitat as well as in the room where I spent all of my time in October. The pool that once held the little whale is now a storage area for drying equipment and enrichment items that the staff uses with Tyonek each day. I sure got my exercise in today, though; which is good because I’ll be having my first dinner out tonight with some old and new friends from Seward. Then it’s off to play trivia at the Yukon, a staple Seward establishment! February 1: We placed fifth in trivia last night (and by ‘we’, I mean my team). Despite my best efforts, I realized I’m way better at animal training then trivia! I’m settling into my sleep pattern and woke up less overnight last night than the nights prior. As for this little whale, he is exploring new enrichment items including toys tied together with tubing that he can drag around with his melon! His is so inquisitive about everything! He still enjoys staff interaction poolside and I spend some of my day just hanging out with him; giving him melon and tongue rubs. Belugas are very tactile, especially at this age when he would be spending all of his time with his mother. The shifts are speeding by! I continue to make each of our days as different as possible while accomplishing all of the goals we have set as a team. February 2-3: These two days have been very exciting for me and my fellow visiting trainers. We were able to start introducing a whistle bridge with Tyonek during his feedings! A bridge is a stimulus that breaks the gap of time between a behavior that the animal has completed with the reinforcement that follows it. It acts as a communication tool between the animal and trainer and tells them, “Yes! That was it! Good job!” A bridge can take many forms; with our seals and sea lions at Mystic Aquarium, we use a verbal cue, the word “good” to communicate with them when they’ve done something correctly. Much like you may use the words “good boy” or “good girl” when you ask your dog to do a behavior and they respond appropriately. With cetaceans, including beluga whales, trainers typically utilize a whistle. Establishing a connection between the whistle and Tyonek’s bottle is an important foundation for his future training. Right now we simply blow the whistle every few seconds while he is drinking from the bottle. Over time he will begin to associate this short, crisp whistle with food. This early conditioning will assist with his training once he is eating fish on his own. The other trainers and I are so excited to be a part of this early training because we all realize how essential the fundamentals are and it’s a rare opportunity to be involved with something like this so early on! Tyonek shows no reaction to the whistle, which is expected at this point. We know that over time what we are doing now will help with his overall training program. And we are all thrilled to be a part of it!